Glyphosate, the world's most widely used herbicide and the active ingredient in Monsanto's weedkiller Roundup, is the subject of fierce controversy all across the globe and is classified by the World Health Organization as "probably" being carcinogenic. A San Francisco court ordered Monsanto to pay $250 million in punitive damages and nearly $40 million in compensatory damages and other costs to Dewayne Johnson, a California groundskeeper diagnosed with non-Hodgkin's lymphoma—a cancer that affects white blood cells—2014. He says he repeatedly used a professional version of Roundup while working at a school in Benicia, California. The jurors unanimously found that Monsanto—which vowed to appeal—acted with "malice" and that its weed killers Roundup and the professional grade version RangerPro contributed "substantially" to Dewayne Johnson's terminal illness. Thousands of lawsuits have been filed against Monsanto, all at varying stages of the legal process. The agrochemicals giant insisted that the court decision "does not change the fact that more than 800 scientific studies and reviews... support the fact that glyphosate does not cause cancer, and did not cause Mr Johnson's cancer." Germany's Bayer, which acquired Monsanto for $63 billion in June, said Saturday that it was "convinced that glyphosate is safe and does not cause cancer." After two years after fierce debate, the EU member states decided, at the end of 2017, to renew the licence for glyphosate for another five years. The EU's executive body, the European Commission, points to the approval of glyphosate by its two scientific agencies, the European Food Safety Authority and the European Chemicals Agency, which do not classify the substance as carcinogenic. But the independence of EFSA has been questioned after media suggested that pages of its report were copied and pasted from analyses in a Monsanto study. The French government promised in May that glyphosate would be banned "for its main uses" by 2021, and "for all of its uses" within five years. In June, a beekeeping cooperative in northern France filed a legal complaint against Bayer after traces of the controversial weedkiller glyphosate were detected in batches of honey. In the autumn of 2017, a French judge who was due to sentence environmental activists for vandalising cans containing glyphosate, asked for advice from the EU regarding the dangerousness of the substance. In 2009, France's highest court, the Court of Cassation, fined Monsanto 15,000 euros ($17,100) for "false adverts" that vaunted the weedkiller Roundup as "biodegradable". The world's third-biggest producer of soybeans after the United States and Brazil, Argentina uses vast quantities of glyphosate. In some fertile plans in Pampa, concerned inhabitants clash almost daily with the farmers for whom the product is indispensible. Without nationwide legislation, the mayors of individual towns and cities have passed measures restricting use of glyphosate. Farmers generally contest the measures, raising tensions further. At the beginning of August, a federal judge in Brasilia ruled that new products containing glyphosate could not be registered in the country. Existing regulations concerning glyphosate were also suspended, pending a government reevaluation of toxicological data. The Brazilian government plans to appeal that decision before the next harvest. 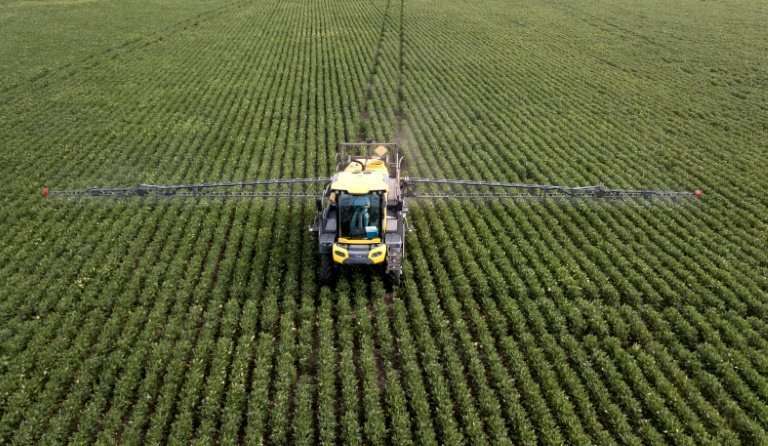 As the biggest economy and agricultural producer in Latin America, Brazil widely uses glyphosate-based herbicides, particularly in soybean plantations. Parliament voted in September 2013 to pull 53 agrochemical products, including herbicides and pesticides, from the market. The decision was partially annulled by the president at the time, Mauricio Funes. He asked that 11 of the 53 products not be pulled on the grounds that they are widely used and that they are not banned at an international level. A technical committee was set up, but there have been major changes to the situation in five years. Glyphosate is still on sale in Salvador. The Sri Lankan government banned imports of glyphosate in October 2015 following a campaign spearheaded by a Buddhist monk. Agricultural organisations criticise the government for not having conducted other scientific research, calculating that the ban cost them 10 percent of the 300 millions of kilogrammes of tea products annually. In July, the government lifted the import ban but restricted the use of glyphosate on tea and rubber plantations.